For a period of time, the “non-fat” epidemic had many athletes running scared of any fatty foods, in fear that they would gain weight. Today, it’s time to turn your shopping carts around and head to your favorite fat sources to not only help you stay full, maintain focus and healthy brain function, but to also improve your overall athletic performance and recovery. Balancing your nutrition plan is essential to athletic success. Finding the right combination of carbohydrates, fats, and protein for your body and your competitive goals will play a key role in your success. As a part of that balance, healthy fats are essential in every endurance athlete’s diet, for fueling and recovery, which is why we have compiled a list of “The Great 8 Fats.” All of these fats have exceptional health benefits and keep your hunger in check so that you can train and race without missing a beat! Note: While fats play a major role in fueling nutrition for endurance activity and are the focus of this article, carbohydrates are the primary and essential fuel source for athletes in training and competition. Our XRCEL ambassadors, Laurel and Rebeccah Wassner, are not only professional triathletes, but they are also foodies, who take their time in the kitchen as seriously as their triathlon training. For more specific fat-friendly recipes, check out how you can incorporate our list of fats into your diet through their athlete-specific recipes. Bon Appetit! You’ll be green with envy when it comes to adding this nutritious fat to you diet. Avocados are not only loaded with “good,” monounsaturated fat, but it also full of fiber. Fiber not only aides in helping you feel fed and happy, but an avocado’s fiber can also help maintain a healthy gut. A less known fact about avocados is that they actually contain more potassium than bananas, so make sure to add some avocado to your pre-workout and recovery meal to help prevent cramping. Start your day with some avocado in your omelet, spread some on the bread of your lunch time sandwich, or add some chopped pieces onto a dinner salad. 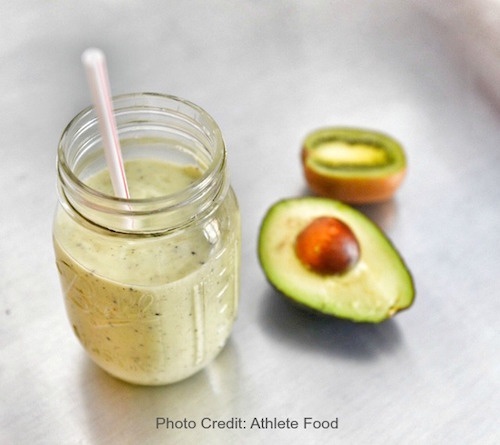 If you like smoothies, then you will love a creamy, avocado-based smoothie. Throw in your favorite milk and protein powder for a filling snack before or after any tough training day. There’s never a bad time to add avocado into your meals to feel great before and after a workout. When you first think of a coconut, you might think of a tropical drink or a day on the beach. However, coconuts have evolved into the endurance world and now, coconut oil, is taking the athletic world by storm. Coconut oil is rich in lauric acid, which can possibly reduce the body’s reliance on carbohydrates as a source of energy and cut the amount of lactate produced during exercise, leading to greater exercise endurance. So what are you waiting for? Try incorporating coconut oil into a pre-workout smoothie with your favorite fruit and milk for an extra boost of energy. Coconut oil is also great for cooking, so stir some into a frying pan to saute your favorite vegetables or meat dish. If you love to bake, use coconut oil to add a healthy source of fat to your favorite baked snack or treat! Calling all chocoholics! You don’t have to wait until the next holiday assortment rolls into the stores to treat yourself to some dark chocolate. Dark chocolate is a year-round, fabulous fat that comes with an array of benefits, as well as a tantalizing taste! Although dark chocolate is high in fat, due to it’s plant-based origin, the cocoa in chocolate, can be seen as more healthy than foods that come from animal fat. Many dark chocolates contain the highest percent of cocoa butter, which is known to slowly digest the saturated fats. This helps keep you feeling satisfied and fight the hunger before a workout. Dark chocolate is filled with a potent antioxidant called resveratrol, which is known to help fight inflammation, helping you recover faster. Pop in a few of your favorite dark chocolate bites for a quick treat or make sure to use dark chocolate in your next dessert recipe. The poor egg has gotten a bad rap over the years, however, the tune on eggs is changing and now, eggs are said to be a good fat to add to any endurance athlete’s food pyramid. Although you do want to eat eggs in moderation due to the high cholesterol, adding in a couple a day as a healthy fat has benefits. Not only do eggs serve as a solid source of protein, but they provide two kinds of healthy fats, monounsaturated and polyunsaturated. Both of these fats contained in eggs, not only help deliver a feeling of fullness after eating, but they also protect your heart by keeping your cholesterol in a normal, healthy range. Adding eggs to your diet is pretty simple, especially if you like eggs for breakfast with some toast and a tall glass of orange juice. Start your morning sunny side up, scrambled, or with a breakfast taco to have an egg-cellent source of fat before you start your training! When it comes time to meal prep, keeping some hard-boiled eggs handy makes it easy to pack in your lunch or slice it up and add to your favorite dinner salad. It’s not just the birds these days that are filling up on seeds as a healthy source of fat. The benefits go beyond the birds, and endurance athletes are loading up on these “superfoods,” particularly, chia and flax, for a source of fat that also aids in recovery. Chia seeds are not only a healthy fat, but also a complete protein source, meaning that they contain all essential amino acids. Adding chia seeds to a post workout smoothie means your body is provided with the protein needed for muscles to repair and recover adequately. As if that wasn’t enough good news, chia seeds high concentration of omega-3 fatty acids are known to help reduce inflammation. Think of how fast you’ll recover from your latest workout! The other “it” seed for endurance athletes, flax seeds, also contain heart-healthy omega-3 fatty oils that help keep you feeling satisfied while contributing other health benefits. Made up with large amounts of lignans, a nutrient found in fruits and vegetables, flax seeds are thought to help fend off cardiovascular disease and osteoporosis. Sprinkle some flax seeds in your favorite yogurt with fruit, or on top of a serving of cottage cheese, add it to your favorite bowl of cereal, or toss it into your favorite salad or salad dressing. Don’t forget to add flax seeds into your muffin mix the next time you decide to bake and start enjoying the tasty benefits of this sensational seed. Olive oil plays an important role for endurance athletes. Like the other healthy fats on our list, olive oil delivers omega-3 rich fats, helping you stay full so you don’t have to worry about getting extremely hungry during workouts. However, what sets olive oil apart from other fabulous fats is it has the ideal makeup for bone health due to its unique combination of oleic acids and polyunsaturated fatty acids, which work together to build bone tissue. This is crucial for any endurance athlete who is constantly pushing their body to help regenerate and gain strength. The omega-3 fats also help produce anti-inflammatory substances that reduce inflammation. This is critical as endurance athletes need recovery time so that their muscles can rebuild and repair. The last thing any endurance athlete wants is their muscle tissue to break down or to feel depleted of energy during a workout. To help aid in recovery and have a healthy store of fat during exercise, add some olive oil to your cooking pan to make those morning scrambled eggs with veggies or mix it with some apple cider vinegar to have a tasty dressing on your lunch time or dinner salad. For a healthy and filling snack, make sure to add olive oil into the mix the next time you make your favorite granola. Salmon not only has the ability to be prepared in multiple, creative ways, it’s made our list because it’s a good source of lean protein and omega-3 fatty acids. This lethally nutritious combo makes a sure-fire way to keep the hunger pangs away. The omega-3 acids, again, aid in reducing inflammation and joint pain, both of which can get in the way of any athlete’s peak performance. Eating some savory salmon before a workout with some steamed vegetables is sure to give you energy and stamina. If you are feeling sore, make salmon your dinner dish to help heal those tired muscles. Whether you bake, grill, or saute your salmon, there are endless possibilities for preparing salmon with your favorite glazes and spices to make it your own, while treating your body to a healthy fat. Mirror, mirror, on the wall, who’s the best nut for endurance athletes of them all? Walnuts have garnished the title of “top nut” by athletes and experts alike, but not just for their healthy fat concentrate. Of all the nuts out there, walnuts contain the highest amount of omega-3 fatty acids, which are beneficial for preventing heart disease and helping to reduce high cholesterol and blood pressure. Walnuts also contain almost twice as many antioxidants as their competitor nuts, which contributes to an athlete’s proper, physical recovery. Walnuts are great for keeping your hunger in check, so don’t be afraid to throw some into your favorite morning yogurt or smoothie as well as a recovery meal like walnut-crusted chicken, or topped on your salad. For more specific athlete-based recipes, check out the Wassner’s website, Athlete Food, which is filled with an array of tasty recipes that are sure to help you incorporate the healthy meals and snacks you need to train and compete at your best! As noted above, reaching balance in your nutrition plan is critical to success. Healthy fats are key ingredients in the overall plan. Balance your healthy fat intake with the right carbohydrates, and use of protein, to optimize your nutrition plan. Adding glucose, a simple carbohydrate is the body & brain’s primary source of fuel, as it is the fastest converting carbohydrate to produce ATP and ENERGY, to your nutrition plan will boost your performance. XRCEL Athlete Fuel is the ideal source of glucose because it is the only glucose supplement that delivers both an immediate supply and an extended release supply of glucose, allowing athletes to fuel quickly and stay fueled over a longer period of time.